Yet nearly a year after Trump slapped tariffs on imported steel, the U.S. steel industry is not thriving. It is reeling. Steel prices have fallen back to pre-tariff levels. Employment is stagnant. The clearest sign that tariffs are not working, however, is the stock market. If the president’s policies were working as planned, the steel industry should outperform other sectors. Yet as the graphic above shows, since Trump announced steel tariffs on March 1, 2018, steel-producer stock prices have plummeted 22 percent—while the S&P 500 index has fallen only three percent. So why has the market soured on American steel? One reason is that Trump’s tariffs, overall, hurt the industry far more than they help. Here is how we know. For the first half of 2018, steel-producer stocks followed broad market performance, even after steel tariffs took effect. 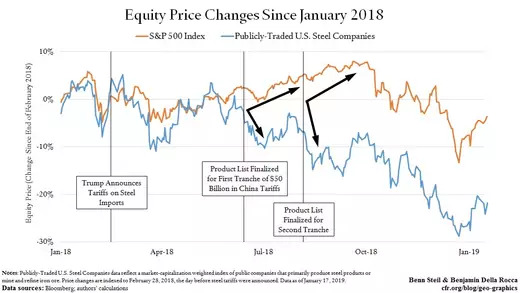 Then, while the S&P index kept rising, steel stocks took two dives—in mid-June and early August, as the graphic highlights—before re-tracking the market. What happened in June and August? Just before each drop, Trump released lists of imports covered by tranches of his first $50 billion in China tariffs. Since 95 percent of these imports were intermediate goods, purchased by American firms, markets anticipated that the tariffs would push up their prices, reduce their output, and hurt their sales. Tariffs would, in turn, drive down their purchases of domestic inputs, like steel. That tariffs are hurting American steel, the very industry they were imposed to help, shows just how misguided they are.